A bomb explosion in Karachi has killed at least 25 people, Pakistani police say. The blast in the mainly Shia Muslim area of Abbas Town destroyed several buildings and set others on fire. Some reports spoke of a second explosion. Rescuers have been struggling to reach people thought to be trapped under the rubble. Pakistan’s Shia minority are the target of frequent sectarian attacks from Sunni militant groups. The explosion sent a huge column of smoke into the sky above Karachi and caused a power cut in part of the city. Residents have been using car headlights to help rescuers search for survivors, local media reports said. More than 50 people were injured, and there are fears the number of dead will rise. Rescue work was delayed as some residents fired guns into the air in anger at the carnage, reports say. Pakistan’s main political and religious leaders rushed to condemn the attack – the latest to target the Shia minority. Nearly 200 people were killed in two separate bombings targeting the Shia community in the south-western city of Quetta in January and February. Some relatives of the victims there initially refused to bury their dead in protest at what they said was the failure of the authorities to protect their community from attack. 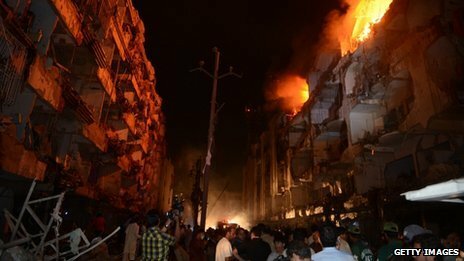 No group has yet said it carried out the Karachi bombing, but correspondents say suspicion is likely to fall on Sunni militant groups. Groups such as Lashkar-e-Jhangvi regard Shia Muslims as heretics and have stepped up attacks in recent years. Some activists called 2012 the worst year in living memory for attacks on Pakistan’s Shia community. Karachi – Pakistan’s biggest city and commercial capital – has a long history of violence. As well as a sectarian divide between Sunni and Shia, that city has also seen conflict between different ethnic communities – Pashtuns from north-west Pakistan, Mohajirs (immigrants from India following the Partition) and Sindhis.